Mahogany is a hardwood that is only available in specific parts of the world. There are three main types of mahogany, which grow in the West Indian islands and parts of the Caribbean, the Pacific coast of Central America and the Florida Keys. Due to their relative rarity and past over harvesting, mahogany has been used a little bit less often in recent years but it is still highly desired. Mahogany usually has a deep reddish brown coloring that makes it popular for furniture and trim in addition to doors. Mahogany has a fine and straight grain, which also makes it a great fit for doors and furniture. It has minimal amounts of pockets and voids in the wood, especially when compared to other timber. This makes it a favorite of craftsmen. 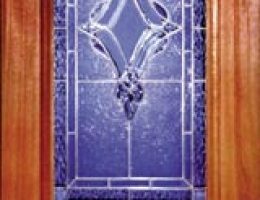 When people see mahogany they recognize quality right away, and when it is combined with the craftsmanship on the doors you can get at Doors of Elegance, it will make a major impression. You can see these doors in person at one of our two locations, either on the Northshore or the Southshore of Lake Pontchartrain. There are more than 70 different styles of beveled glass doors available, including some in mahogany wood. They are insulated to improve the efficiency of your heating or cooling systems in your home, but still maintain their impressive design and elegance. 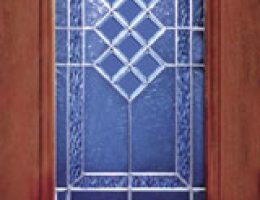 Many have rectangular panes of glass inside the frame of the door, but some of them also have designs in the glass, which adds to the stately look of the entire door. There are also door designs with twin rectangular panes available, with panels of wood in between. Other styles include arcs atop a rectangular base, either joined in the glass pane or separated by a wood panel. The intricate designs in the glass by way of gold colors or other similar colors create a more upscale, classical look. If you prefer a door with a more rounded pane of glass inside of it, oval-shaped panes are available. These have inlayed designs that draw a lot of attention. In addition there are smaller circles that are higher up on the door, which provide a bit of a simpler look for the design. 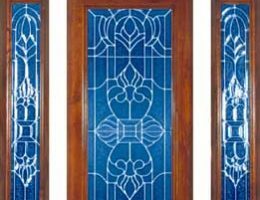 These will have a lot more wood and less glass in the door, so if you really want the mahogany door to shine on its own, these might be a preferred option for you. As the doors get more elaborate in design, there are panes of glass that have wood inlayed into the pane in various shapes. 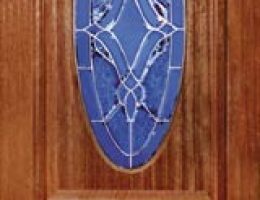 In this case there may be a lot more glass than mahogany wood in the door, but the wood shines in the overall design due to the intricacy of the inlay. The glass in our beveled glass mahogany doors is designed with two goals in mind. First, it is created to improve the energy efficiency of your home when compared to lesser quality glass in doors. Second, it provides a look of luxury, style and beauty in your door. It utilizes varied glass, which gives the look more depth and creates a prism effect that some describe as magical. Used in many different shapes and sizes depending on the style of the door, the glass can give your doorway an added appeal. When your visitors see your door they will be impressed and the tone will be set for your interior décor.